India is the birthplace of four of the world’s major religions and an unwavering sense of faith dominates Indian day to day life. Whether you’re travelling on a religious pilgrimage, want to explore your heritage or simply wish to bask in the glory of beautiful architecture or breathtaking landscapes, there is no better place on Earth to undertake a journey of profound spiritual significance. Some of the world’s most important and impressive holy sites can be found in India, and few can question their power to inspire and overwhelm. Literally translating to ‘Great Awakening’, the Mahabodhi Temple in Bodhgaya marks the spot where Siddhartha Gautama, the Buddha, received enlightenment. The most sacred Buddhist site in the world, the temple is visited by countless Buddhists, Hindus and tourists alike each year, for even those not journeying on a religious pilgrimage still appreciate the awe-inspiring beauty of Mahabodhi. One of the earliest Buddhist temples to be built by brick, the central tower rises a staggering 180 feet, standing as a true beacon of faith. Immediately next to the temple is the Bhodi Tree, said to be a descendant of the very tree the Buddha sat under. Glittering on the horizon, the Harmandir Sahib in Amritsar, Punjab, is the holiest Sikh shrines in all of India. More commonly known as the Golden Temple, the resplendent structure is a major pilgrimage destination for Sikhs the world over, though its beauty ensures it remains an extremely popular tourist attraction. Construction of the temple began in 1574. Although completed in 1601, it did not gain its distinctive, iridescent façade until the early 19th Century, when 100kg of gold was applied to the inverted, lotus-shaped dome. 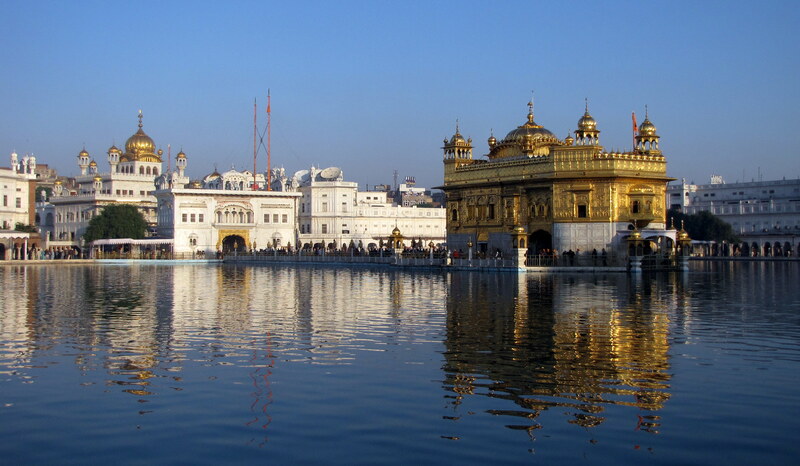 Harmandir Sahib literally translates to ‘temple of God’, and the four entrances to the temple symbolise the openness of Sikhs towards all people. The Ganges is so much more than a river. Whilst is rightly considered a lifeline for the millions who depend on it for their daily needs, it also stands as a powerful and everlasting symbol of faith. Revered by the Hindus as a sacred river, the Ganges embodies the goddess Ganga and is worshipped along every fragment of its length. Hindus bathe in its waters (to fully submerge one’s self in the water is thought to wash away sin) and pay homage their ancestors by offering gifts of flowers and floating candles. The city of Varanasi, built on the bank of the river, is the spiritual capital of India. A series of 29 Buddhist cave temples, the Ajanta Caves preserve some of the most spellbinding examples of Buddhist art in all of India. Dating as far back as the 2nd Century BC, many visitors and pilgrims explore these caves in conjunction with the Buddhist, Hindu and Jain Ellora Caves nearby. Carved out a horseshoe-shaped cliff along the Waghora River, the caves were first used as chaitya grihas (prayer halls) by monks but then suddenly abandoned. They disappeared from history until they were rediscovered in all their glory in 1819. Adorned with elaborate carvings and murals, these shadowy caves resonate with an air of profound spirituality.